Card Review: 9.8 I rank this just a notch below the '85 Topps base card. In a lot of ways I like it better. 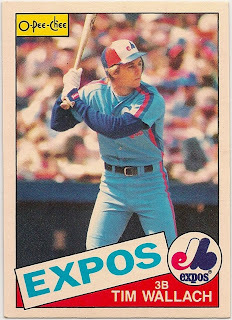 But ultimately I prefer the color scheme on the back of the Topps a little bit more, and though I like the yellow "o-pee-chee" logo, it's just a little too much. A big advantage for this card over it's Topps counterpart, however, is the number. 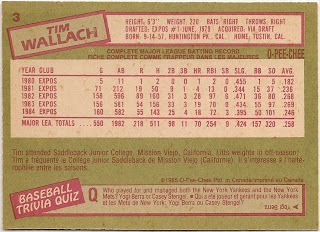 I believe #3 is the lowest number any Wallach card was given in a widely issued base set. Perhaps, large set is a better qualifer than widely issued, by you get the gist. 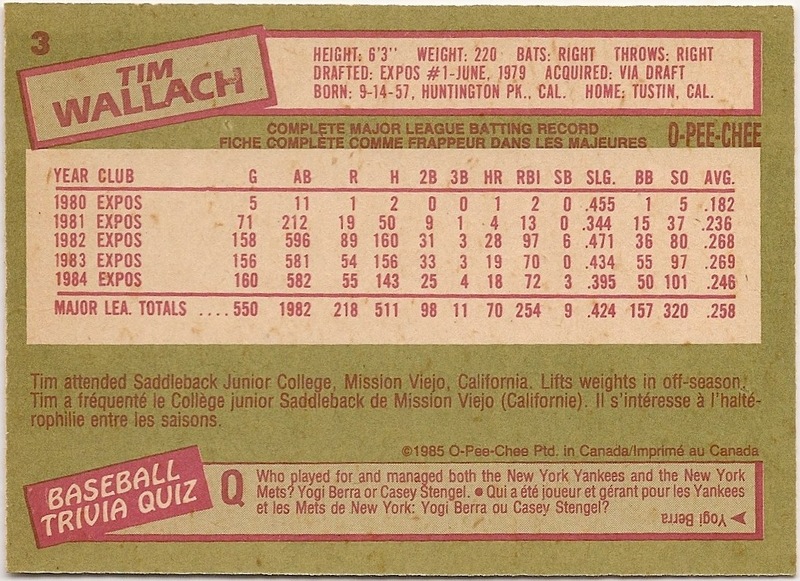 In fairness to Topps, they issued a lot of cards to Wallach that ended in "0" or "5," which were reserved for the stars. Nonetheless, I like seeing the #3, and the idea that this is on the first page of binders full of '85 OPC, or at least, for the handful of people that put the '85 OPC set in a binder.